BUSY TIMES - EXCITING TIMES - AND ITS ALL HAPPENING AT OCCBC. So with the outdoor season only with us for a few more weeks - culminating in the usual hectic activities getting to see who won what etc and the ensuant Presentation Dinner to round things off….and thats just for starters, for we must also remember that our Summer Section Indoor competitions are also reaching their climax….much to look forward to. We are now delighted to announce a link with Oxford United FC - as part of their Community Programme - which will bring together people of all sports and encouraging people to take an active part if at all possible. To this end we have had several lunches and meetings with Darryl Eales (Chairman OUFC) Mark Ashton (CEO) Cheryl (PA to Directors) and Caroline Robbins (Community Operations Director), to move this worthwhile enterprise further - and also enabling us to be part of the wider picture which hopefully will benefit many more youngsters and adults in the area. 9th SEPTEMBER….a note for your diaries. To get us started, we will be holding a OPEN DAY with Oxford United FC at Oxford City and County Bowls Club, where the owners, CEO, Manager, players and staff will all join in what we know will be a fun event….nows your chance to meet, chat and mix and pit your skills with them all on the Bowls Green - yep, for most people it will be their first taste of what it is all about - our coaches will be there to give a helping hand! The day starts around 3pm and will go on until about 8pm (we will supply all equipment - but it would help us for those who 'will have a go' if they would wear flat shoes. If it is wet on the day, we do have the luxury of both Indoor and Outdoor Rinks). OUFC will be presenting prizes……..
We are also delighted that Stewart Donald who owns Bridle and Eastleigh FC as well as being major sponsors to both us and OUFC, will also be coming along. The evening will conclude with a FANS FORUM, when Darryl, Mark and Michael Appleton will be in the firing line to answer all your questions about anything OUFC. The Bar and Kitchen will be open throughout………so, if you are coming straight from work, we will have hot and cold food available. BBC Radio Oxford will be covering this event……Rosemary Phelps, our Coaching director, will be speaking with Jerome Sale on Rad Oxford at halftime during OUFC v Bristol Rovers, to further promote their Community Program - and our Open Day. We're about more than just football; the Oxford United Community Trust is about trying to engage people from across Oxfordshire in positive activities of any kind, with balls of all shapes and sizes and some with no balls at all. As hinted at last week, one of the activities we're working to promote and engage people in is bowls. Sometimes seen as an old man's game this sport is hugely undersold. Hosted by the City and County Bowls Club Darryl Eales, Chairman, Mark Ashton, CEO and Caroline Robbins, Operations Director have all had a go and let us tell you, it requires some serious skill to get those weighted balls to where you want them to be but it's brilliant fun working out how to do it. To help us get our eye in the Bowls Club have very kindly offered to host an open evening on the 9th September. From 3pm children, young people, parents and careers are welcome to come to the club and have a go, get some expert tips from Rosemary, the in house coach at the Bowls Club and see Olly and Olivia give it their best shot too. At 5.30pm anyone is welcome to come along and try their hand. Fans are invited to enter teams of 3 or 4 people in a friendly competition with prizes available from Oxford United and the Bowls Club. Rosemary will be on hand to provide tips and Oxford United players and staff will be joining teams giving fans the opportunity to really get to know the names and faces of both the Club and the Community Trust. Once prizes have been awarded the City and County Bowls Club have kindly agreed to host an Oxford Fans Forum, giving fans the chance to ask us any questions you might have. With a bar and kitchen open serving food and drink throughout the evening there's not much more you could ask for. 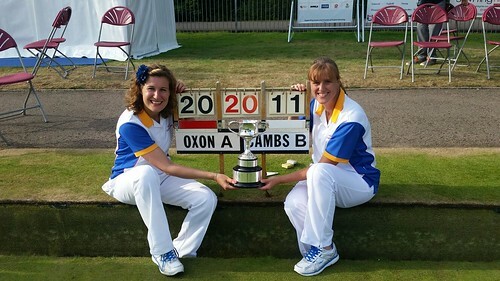 The BBC Radio Oxford Breakfast Programme (7am - 9am) will be held at City and County….where we will be attempting to introduce Ross Heaton to the game of Bowls - and also to tell you something about another great event we are hosting the following day………………….and that relates to the UK Under 25 International Series - a chance for us all to witness the very best that England, Scotland, Wales and N.Ireland can offer. A must see. BBC Radio Oxford will be covering this event too. …..this is when the Under 25's show us what it is all about………..we are expecting a good crowd, so my advice is to arrive early. Our Indoor Season gets going in a few weeks time……..and we welcome back to our fold, so many of our regular members whose other clubs do not have an indoor rink………we have quite a healthy fixture list this coming season and the Members Indoor Year Book will be sent out to you all in a few days - so you will be able to get notice of all up-coming fixtures et al, including our in-house leagues……worth mentioning that last year we had a total of 89 teams competing on the various days and there seems to be a similar number this season. A special mention to Vera Logue who does such a sterling job in this respect……as do so many others. Finally a mention of our Web-Master, Merv Gleeson for his tireless work making this Web-Site work - our readership is quite staggering…..but I am sure Merv would be delighted to hear from anyone who wants to make a contribution……. Happy Bowling my friends…..and above all, have fun. Runners Up - Pat, Angie, Margaret. from Banbury Borough Bowls Club. 3rd prize, Jane Murphy, Jacky Gray and Julie Jackson, Oxford City & County B.C. Thanks to Ron and Carole Thornhill for acting as Umpires; to Marston's Brewery for sponsoring the event, OC&C for hosting; to President Vic Bye for giving out the prizes, a role usually carried out by the nephew of Ellen Clarke, Ken Meadley, who, due to ill health, was unable to join us this year. We hope to see him and the sister of Ellen Clarke (who usually accompanies him) in 2016. Number of teams - 11, down from previous years - the names of clubs are attached. Our grateful thanks must go to Helen Kingsley for all her hard work in organising this competition.